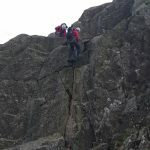 The team was called after reports of shouting could be heard from Fisher Ground campsite in the area above Milkingstead. Upon investigation nothing was found and the shouting was put down to a local farmer gathering his sheep. 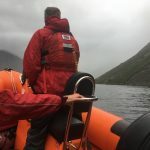 We were called by Police about 2 walkers who’d become stuck on the Wasdale Screes having ascended above the nominal line of the path in an effort to find easier ground. 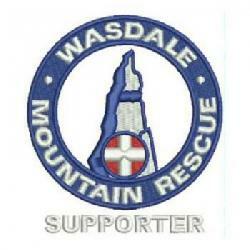 They were located using PhoneFind then a party went on the screes to help them off. 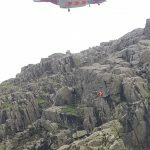 We were called by NWAS about a cyclist who’d fallen off their bike descending Hardknott Pass below the fort and sustained a deep gash to their knee. The casualty was treated on the scene. The ambulance had to stop at Cockley Beck so we took the casualty back over the pass for a handover.